20 years after Earth was first invaded, the aliens have returned. Thanks to intelligence from recovered alien technology, the world's nations have collaborated on a defense program to protect the planet. However, nothing could have prepared us for the alien’s advanced and unprecedented force. It is, once again, up to the courage and ingenuity of a few brave men and women to save humankind from extinction. The trailer for Independence Day: Resurgence (IDR) provoked a heady mix of excitement and nostalgia. Could it really be 20 years since director Roland Emmerich’s genre defining movie: Independence Day? The feeling of excitement grew in the weeks leading up to IDR’s cinematic release - particularly following news that many of the film’s original cast members were to return. How thrilling to see Jeff Goldblum, Bill Pullman and Judd Hirsch reprise their roles. No one was expecting Citizen Kane, of course, but we were all hoping for some silly, explosive fun. And so Emmerich’s film arrived in cinemas on a wave of nostalgic goodwill and anticipation. I didn’t hate IDR, but I left the cinema feeling unbelievably disappointed. For a start, the movie makes no sense. The plot is eye rollingly bad at times. This wouldn’t be so bad (or so obvious) if the film was fun - but it isn’t any fun at all. IDR introduces a number of new characters. All are played by charismatic actors, capable of powerful performances. However, there are far too many fresh faces and the film does not take the time to make us care about any of them. It all feels like such an unnecessary mess. Character development has been sacrificed on the altar of special effects in IDR. Don’t get me wrong, I love a bit of senseless destruction and there are some impressive scenes. However, this is not 1996 and we’ve seen all of this stuff before. As a result, IDR kept reminding me of other films - films that I have been invested in, films I have enjoyed far more. That is not to say that IDR has no redeeming qualities. It features, after all, a performance by Jeff Goldblum as David Levinson. Goldblum is brilliant and steals every scene. However, there is just not enough of him and the film feels flat in his absence. There is also the matter of the Will Smith-shaped hole in this movie. Smith lit a fire underneath Independence Day and boy did we ever need him in IDR. Rumour has it that he asked for too much money to reprise his role as Captain Steven Hiller. Surely it would have been money well spent, whatever the figure. There is an interesting theme in IDR about global cooperation. While the film remains focused on America, it also involves other nations - all pulling together to defend the world. It is just a shame that this story thread wasn’t developed. It ended up feeling like a clunky attempt to appeal to the burgeoning Chinese film market. As Independence Day: Resurgence draws to a close, the film all but throws a sequel in your face. Oh yes, it’s all about the franchise folks. Sadly, Emmerich’s film failed to leave me wanting more. I’m not angry about this sequel, just disappointed. 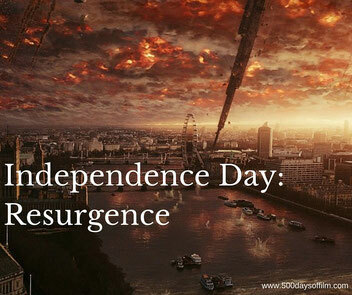 Have you seen Independence Day: Resurgence? If so, what did you think of this movie? Did you love it? Hate it? Whatever the case, let me know by leaving me a comment in the box below!